64th Brandywine Otter Scouts at the Giving Tree. L-R: Riley Pacienza, Kyra Perkins, Corrine Perkins, Zane Page, Nicoli Morgan, Sara Ball, Samuel Castelo, Timberwolf Dylan Ball, Julian Hontz, Alex Chase, Carolyn Williams, and Assistant Otter Leader Rich Morgan. 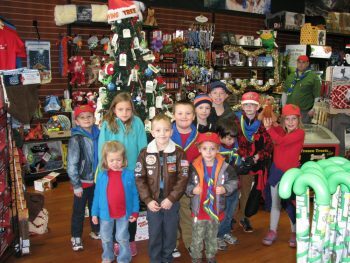 WEST GROVE — On Sunday, November 20, Otter Scouts of the 64th Brandywine Baden-Powell Service Association (BPSA) decorated their third annual “Giving Tree” at the Pets & Friends store in Jenners Village Shopping Center. The Holiday Giving Tree is trimmed with handmade tags identifying requested donations for local pet rescues and shelters. Throughout the holiday season, shoppers can select a tag and purchase or provide the item for donation. Donated items are collected under the tree. The Otter families will sort and deliver the gifts to participating organizations. Pet rescue groups need dog and cat food, collars, leashes, beds, and much more. Donations to this year’s Giving Tree benefit several local rescue organizations and shelters: Brandywine Valley SPCA, Greenmore Farm Animal Rescue, Senior Dog Haven & Hospice, It’s a Ruff Life Rescue, LaMancha Animal Rescue, and Rescue Dogs Rock Animal Rescue. Members of the community can visit the tree and leave donations throughout the holiday season at Pets & Friends, 51 Jenners Village Center, West Grove, PA 19390, during regular business hours.